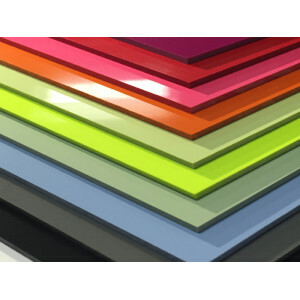 Coloured PVC wall cladding can be fixed to the majority of dry substrates dependent on surface suitability. Using the adhesives in association with our range of profiles is all that is required to provide a complete hygienic installation. Using a soft cloth and diluted mild detergent is normally all that is required. Do not clean using any solution with a temperature exceeding 60°C. Do not use any abrasive cleaners, pads or wire wool as this will damage the surface. uPVC is a self extinguishing fire retardant material. Our cladding materials are tested to meet the BS 476 part 6 and Class 1 at BS476 part 7. For other certification information please visit our website. All our uPVC cladding materials conform to all the latest regulations intended for food contact, please contact us for current compliance certification. Sheets should be fully supported and stored on a flat surface. They should be left for a minimum of 24 hours to attain the ambient room temperature prior to installation (min 14°C).